I was born and undertook my primary and secondary education in North Devon, I then entered the Royal London Hospital Dental School in 1990. Following my preclinical years I was invited to undertake an intercalated BSc in Physiology with Basic Medical Science, and selected to obtain a Medical Research Council Grant to support this period of study. I completed this BSc in 1993 obtaining a First Class Honours Degree and completed my BDS in 1996 qualifying with Distinction in Restorative Dentistry. I was always keen to be an academic but wanted to get experience of general dental practice before embarking on this, spending 5 years working on the NHS initially as Vocational Trainee, Associate Dental Practitioner and then Principal Dental Practitioner. In January 2000 I undertook the Certificate Course in Restorative Dentistry at the UCL Eastman Dental Institute, and then progressed to undertake the MSc in Conservative Dentistry, qualifying in September 2002 with Distinction, and being awarded the 3M prize in Conservative Dentistry for clinical and academic excellence. I was appointed full-time Clinical Lecturer in Fixed and Removable Prosthodontics at the UCL Eastman Dental Institute in October 2002, Programme Coordinator for the MSc in Conservative Dentistry in 2003 and Programme Director in 2007. I completed my Specialist Training in Restorative Dentistry in December 2007 at The UCLH Eastman Dental Hospital and completed my PhD in 2009 at UCL entitled “Sol-Gel Derived Hydroxyapatite, Fluorhydroxyapatite and Fluorapatite Coatings for Titanium Implants and Bone Grafts”. I was then promoted to Senior Lecturer in Prosthodontics / Honorary Consultant in Restorative Dentistry in 2009. 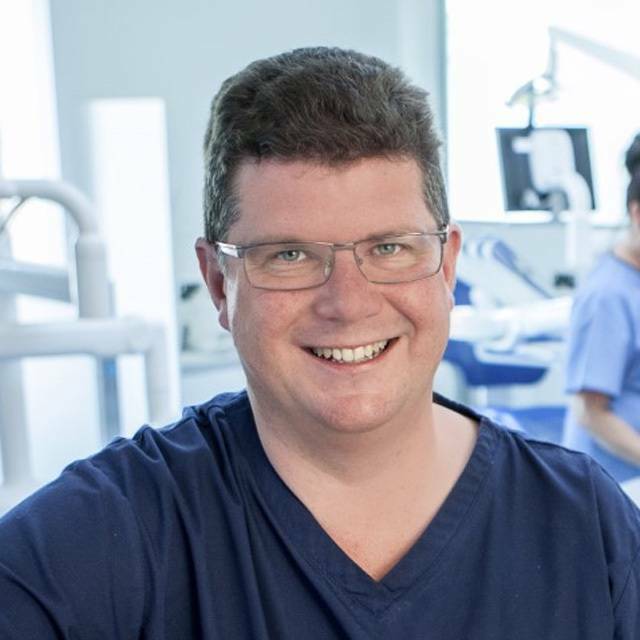 In 2010 I was offered the opportunity to take up the position of a Chair at Plymouth University and appointed to the position of Professor of Restorative Dentistry and Director of Clinical Dentistry. I took over as Head of Plymouth University Peninsula Dental School in July 2012. To date I have published 41 papers and supervised 47 masters projects. I am part of an active research group at Plymouth developing novel bone grafting materials and currently have 6 PhD students. I am extremely fortunate to be working with an outstanding team at Peninsula Dental School. October 1990 – July 1996 St. Bartholomew’s & The Royal London School of Medicine and Dentistry, University of London. Bachelor of Dental Surgery, with Honours. First Class Honours Degree awarded. October 2001 – September 2002. : Master of Science in Conservative Dentistry. Eastman Dental Institute, University College London. Title of thesis “Sol-Gel Derived Hydroxyapatite, Fluorhydroxyapatite and Fluorapatite Coatings for Titanium Implants” Awarded April 2009. May 2003 – Membership of the Faculty of Dental Surgeons (Royal College of Surgeons of England). June 2003 – December 2007. Fellowship in Dental Surgery in Restorative Dentistry, Intercollegiate Royal College of Surgeons. Certificate of Completion of Specialist Training in Restorative Dentistry. Registered Specialist in Endodontics, Periodontics, Prosthodontics and Restorative Dentistry with the General Dental Council. September 2002 – July 2004. Certificate in Learning & Teaching in Higher Education. University College London. RPHEA ref:29499 12/04/05.